The Vivia Nail Locke Theatre is found in the Seretean Center for Performing Arts (SCPA), located at the corner of Maple Ave and North Knoblock St in Stillwater. The Theatre Office is located in room 121 of the SCPA, just down the hall from the Vivia Locke Theatre lobby. The Box Office is located in the Vivia Locke Theatre lobby. The Jerry L. Davis Studio Theatre is found in room 203 on the second floor of Gundersen Hall, located directly West of the SCPA (between the SCPA and Student Union). Seating is assigned automatically when purchasing online. If sitting with a group, the group tickets must be purchased together in one transaction or the group will not be seated together. Sign up with your email below to be notified of upcoming shows and Theatre news! You may reserve tickets for your preferred performance at any time by calling (405) 744-6094, visiting the Theatre Office or emailing michele.hockersmith@okstate.edu. If tickets are not reserved for each production, seats at a preferred performance time cannot be guaranteed. Are you a FRESHMAN hoping to see a free show? For groups with 10-24 guests, tickets will have $1 taken off the price (i.e, general admission tickets will be $11, senior tickets will be $7 and student tickets will be $6). For groups with more than 25 guests, tickets will have $2 taken off the price (i.e., general admission tickets will be $10, senior tickets will be $6 and student tickets will be $5). Groups wishing to receive the group rate discount must contact the Box Office to purchase tickets. Discounted group tickets can't be purchased online. Ticket sales for Main Stage Productions begin three weeks prior to each performance. Studio Season ticket sales will vary - see Current Season for more information. Season tickets are redeemable for all four shows in the Main Stage Season and may be purchased prior to the first show. Season Ticket holders will be added to our email or mailing list and may reserve tickets for their preferred performance at any time by calling 405-744-6094 or by visiting the Theatre Office. Click here to view the seating chart for the Vivia Nail Locke Theatre. If tickets are not reserved for each production, seats at a preferred performance time cannot be guaranteed. Online tickets are purchased via the OSU Marketplace with a credit or debit card (Visa or Mastercard), using the link located to the right. PLEASE NOTE: Seating in the Vivia Locke is assigned. When purchasing online, the best-available seats will be assigned automatically. If requesting ADA seating or other accommodations, you may still purchase tickets online, but please call the Box Office at (405) 744-6094 to arrange your preferred seating. If sitting with a group, the group tickets must be purchased together in one transaction or the group will not be seated together. You may pick up tickets with proof of identity or your receipt at Will Call in the Box office one hour prior to curtain. The Box Office will close approximately 15 minutes after the show begins. Refunds are not permitted, but tickets may be returned and exchanged for any other showing of the same production. Cash, check, credit card (Visa or Mastercard), and OSU Bursar are all acceptable payment for Main Stage tickets. Payments cannot be accepted by phone, but tickets may be reserved by calling 405-744-6094. 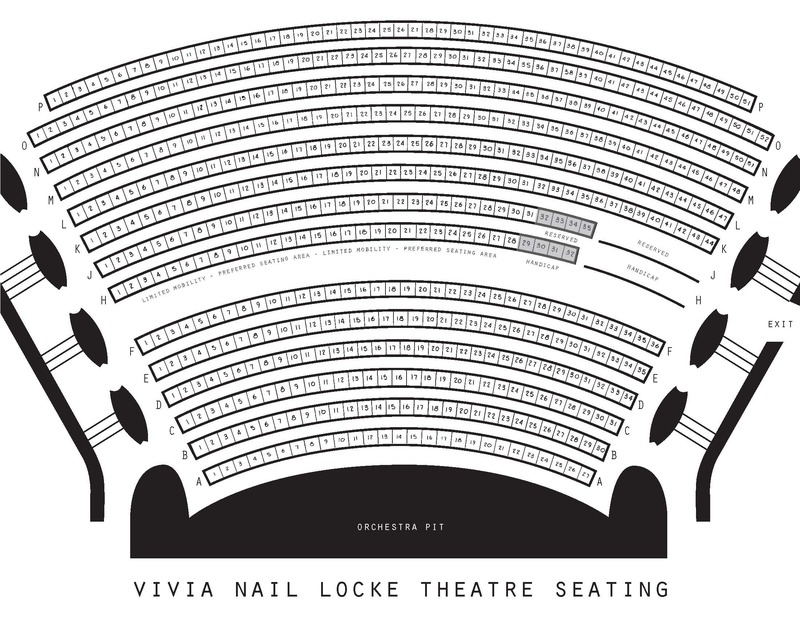 Click here to view the seating chart for the Vivia Nail Locke Theatre. The Vivia Locke Theatre begins seating for Main Stage Productions 20 minutes prior to curtain. Reserved (unpaid) tickets will be held until 15 minutes prior to curtain. Unpaid tickets may be resold at this time. The Box Office closes approximately 15 minutes after the show begins.